Denzel Valentine will likely be one of the few first round picks legally old enough to celebrate Thursday’s NBA draft with a glass of champagne. 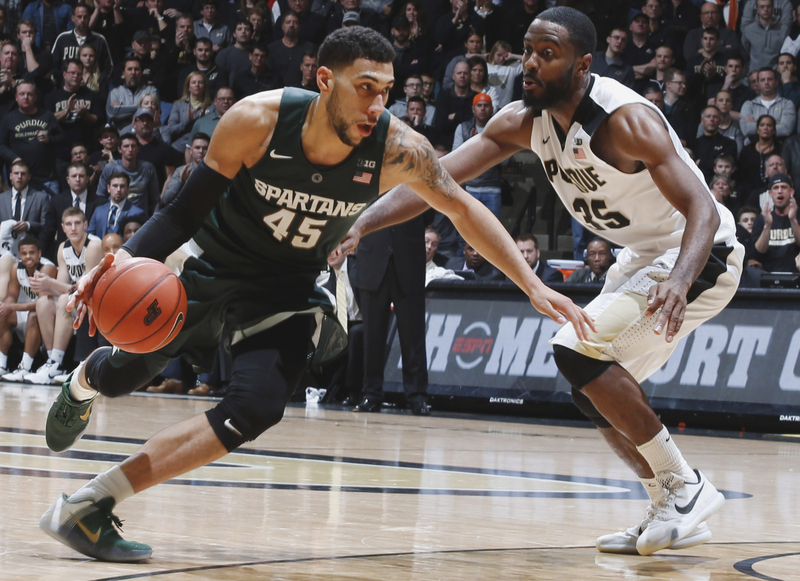 With the top picks typically one-and-done college players and teenagers from abroad, the Michigan State star also could be the latest college senior affected by ageism at the draft. Another former Michigan State player, Golden State Warriors forward Draymond Green, said he expects Valentine is being overscrutinized just like he was after completing his senior year. Green was taken in the second round by the Warriors with the 35th overall pick in the 2012 draft. Four years later, he’s an All-Star, an NBA all-defensive first team selection, an All-NBA second-team selection and a member of USA Basketball’s Rio Olympics squad. A member of the 2015 NBA championship team, he can recite from memory each player who was drafted before him. Last year, only four seniors were taken in the first round. The year before, it was five and in 2013, it was only three. This year, two seniors have the potential to be lottery picks: Valentine and Buddy Hield. There have been only four seniors selected in the last five lotteries combined. There haven’t been multiple seniors selected by lottery teams since 2009. Still, good luck finding a draft prospect with a stronger resume than Valentine’s. The 6-foot-5, 210-pound swingman earned 2016 College Basketball Player of the Year honors from the Associated Press, the National Association of Basketball Coaches, Sports Illustrated and others. He averaged 19.2 points, 7.8 assists and 7.2 rebounds per game while shooting 44 percent from 3-point range. He was the winner of the Julius Erving Small Forward of the Year Award from the Naismith Memorial Hall of Fame, given to the nation’s best small forward, and he was also named to USA Basketball’s Select Team this summer. The Milwaukee Bucks (10th pick), Orlando Magic (11th) Utah Jazz (12th), Phoenix Suns (13) and Chicago Bulls (14) are teams with Top 15 picks who have worked out Valentine. He was projected to be a late draft lottery pick a month ago. But the NBA team official now projects he’ll be a middle to late first round pick. Michigan State Spartans guard Denzel Valentine (No. 45) drives to the basket against Purdue Boilermakers guard Rapheal Davis (No. 35) at Mackey Arena. Purdue defeated Michigan State 82-81 in overtime on Feb. 9. Valentine said the lottery teams are making a huge mistake in how they view him. “I’m going to have a big chip on my shoulder because I feel like I’m in there with the top three players, if not the best player in the draft. I feel like I’m up there. So why is Valentine dropping? The NBA scout said there is a “little” concern about Valentine’s knees because he had arthroscopic knee surgery last December that caused him to miss four games. According to Basketball Insiders, there are teams that believe that Valentine has a degenerative knee problem. Valentine said he’s healthy and was shocked by the recent report on his knees. “I only missed four games in my career ever,” Valentine said. “You can count on both hands the amount of practices that I missed … With the amount of games I played, I think I was pretty healthy in college. My body is in great shape right now. I feel healthy as ever. Valentine is not the only senior being scrutinized closely. ESPN draft insider Chad Ford said Hield, a guard out of Oklahoma and a projected Top 10 pick, could struggle in the NBA because he didn’t succeed until later in his college career. Using himself as an example, Green believes that NBA teams lose out when they give more weight to talented, but unproven, freshmen over seniors who have actually produced on-court results. Valentine plans to have his parents, brother, Michigan State coach Tom Izzo and agent B.J. Armstrong sitting with him at the draft table in the green room. “This is something I’ve been dreaming about my whole life,” Valentine said. “It’s finally here. All that work that I put in, my family sacrificed and everything that came with it. It’s hard work.